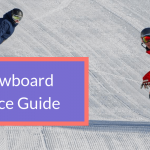 Before heading out onto the slopes it is important to understand that light levels and visibility can quickly change in a snowboarding environment. 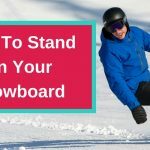 Snowboarding can become very dangerous and disorienting with bad visibility. 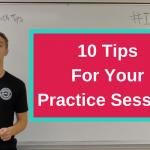 You are left unable to see other slope users, obstacles, and changes in terrain. Choosing the right goggle lens for the conditions can dramatically improve your vision and comfort on the slopes. 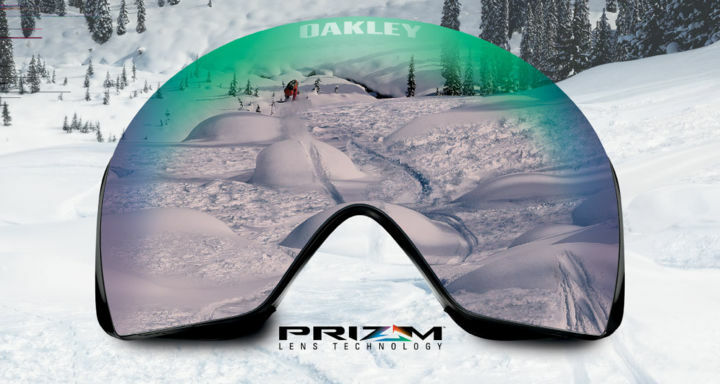 I have found the Oakley Prizm lens to be a game changer, it’s like snowboarding in high definition! 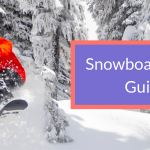 If you are having difficulty snowboarding because of low light levels and poor visibility, try to ride in or near the trees! Trees give you points of reference and separate the fog/cloud which increases your ability to discern shapes and changes in the terrain. On low visibility days, you should try to avoid the barren peaks of larger mountains because you can get disoriented. The conditions on a mountain can change in an instant, so having multiple lens comes in handy. There are several types of lenses to choose from. Each works to enhance brightness in different ways to enable you to have the best possible riding experience. 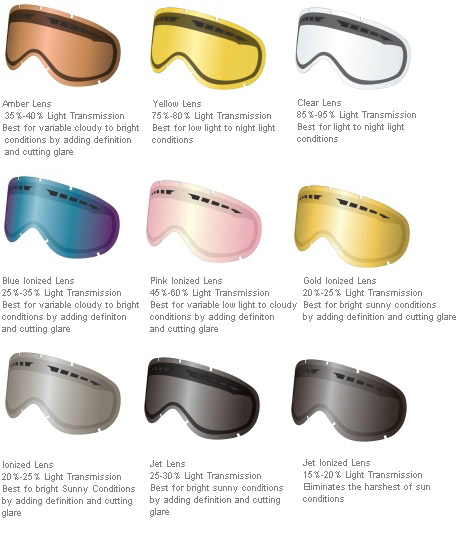 Different colours of tint in your goggle lens help to enhance snow definition in low light or to damper glares on sunny days. The levels of VLT (visible light transmission) in your goggles will determine whether they are preferable on sunny or cloudy days. Lenses with high levels of VLT should be used on cloudy days. And lenses with low levels of VLT are more useful for sunny ski days. There are three large categories of lens tints: Low light, medium light, and light bright. On light and bright days, you will want to equip yourself with darker tints such as grey, copper, or dark blue. Medium-light days require a light gold or pink less. And yellow lenses or very light in colour lenses are best for low-light days. 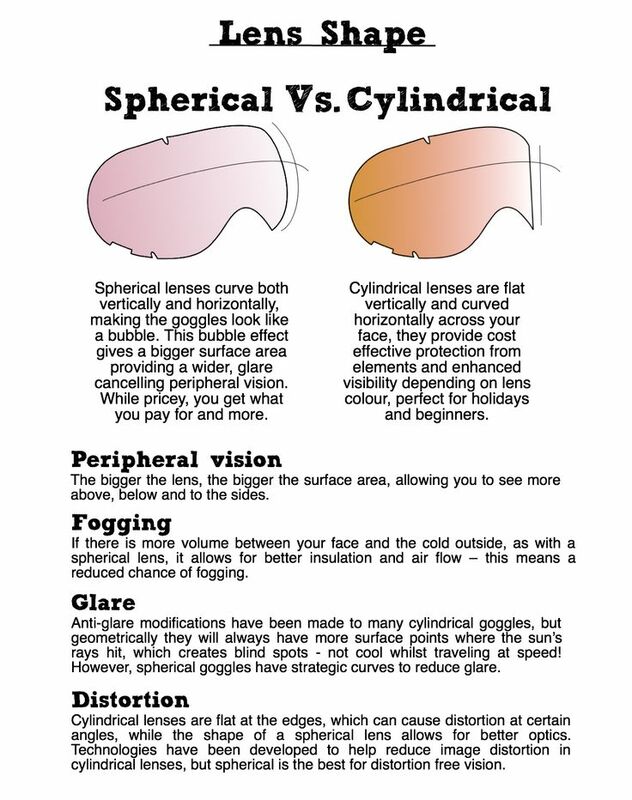 Frameless spherical goggles give you the most amount of peripheral vision. Spherical lenses are also the least likely to have fog up. Lenses are most often comprised of two separate lenses which are fused together. Goggles with frames accumulate moisture in the padding around the frame. This moisture than oftentimes leaks between the two frames and causes fog. You cannot wipe this fog off and it is difficult to get rid of. Frameless goggles present a great option to avoid this from occurring. If your goggles are fogging up place them near a heater to dry the moisture out. 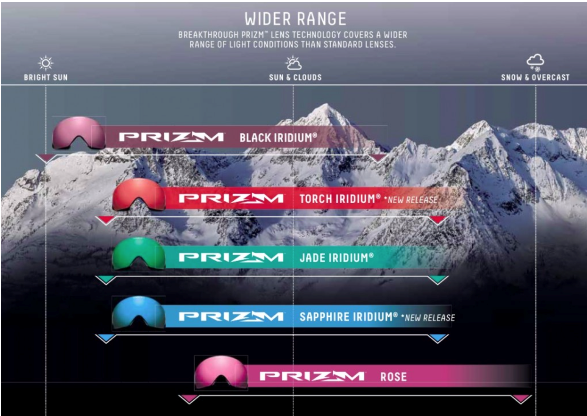 Watch & Ride’s go to goggle for snowboarding is the Oakley Airbrake XL Prizm. They help you to see the slopes with sharper vision! Rose and jade tint Prizms lenses are a revolution in lens technology. They allow you to see in a variety of different levels of light. In foggy or flat light days the rose tint provides crucial extra definition on the snow to stop you getting caught unaware. They also have a spherical frameless lens which gives you a huge range of vision. The mechanism lets you pop your lens in and out while you’re on the go. The right lens can really enhance your enjoyment and confidence. 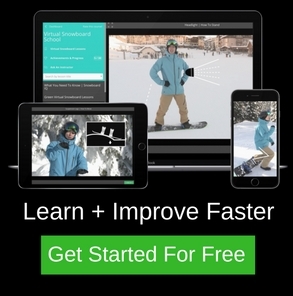 Think about checking your resort webcam before heading out for the day to help you prepare with the right goggle lens!